by Erik Everts, Founder of The Blue Buddha. I’ve never met Johnny Pearman. But just as I was thinking about wanting to interview a fitness trainer (or perhaps you call them personal trainers), Eric of Eric Kerr Acupuncture told me about a trainer he met and was going to work with trading treatments for sessions. Once Eric got started he reported back with glowing reviews for Johnny and his approach to training. He described him as the only man that could get him to the gym. Because I’m always dreaming of having that hot beach-ready body (it may never happen but it’s important to have dreams! ), I wanted to learn more about Johnny and the training that Eric was raving about. While we’ve never met, I feel like we have because Johnny’s one of those great social media entrepreneurs who utilizes video quite a bit. Video and fitness training are a perfect fit since learning proper technique in many cases is key to safety and results. All hot beach body joking aside, I recognize how incredibly transformative working with a fitness trainer can be. One of my bodywork mentors has been a trainer for about 30 years and her knowledge of the body in all of it’s subtleties continuously astounded me. 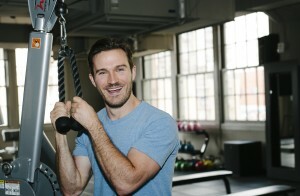 What drew me to want to learn more about Johnny’s approach to working with clients is his connection to happiness and a healthy body that’s able to move through space with strength, flexibility and grace. And it doesn’t hurt that Johnny clearly infuses his work with joy and a contagious smile. Your StudioMix profile states the following as your fitness philosophy: “Your happiness is your health. The world is best experienced with high energy, low pain, and high function. Worship your physical self because it is your vehicle for your every desire and dream.” What do you see as the role of the fitness trainer in a client’s life? The role of the fitness trainer in a client’s life is to be the expediting force behind a new, healthier existence for the client. My primary role is to listen to the needs of the client and approach them with the appropriate tools for a complete lifestyle change. What brought you to the world of fitness training? Over-training in collegiate sports brought me chronic pain in my legs and knees. I decided to walk away from potential permanent damage in the direction of knowledge. I added another major, Exercise Science, and learned as much as I could about human anatomy, kinesiology, biomechanics, strength and conditioning principals, etc. and BOOM I was hooked for life! Describe a new clients first visit with you. Smiles. Sweat. Laughter. The client learns to be relaxed, learns to trust me and quickly adapts to my calm push for excellence. Like a great first date, I always say. From your experience what’s the number one reason that clients begin to work with you? Most people are unhappy with where they are. Their heart, mind and body aren’t aligned. They don’t recognize the person in the mirror. And they want to reconnect with their potential. Fitness training is not about anyone else but YOU. What misconceptions or myths about fitness do some clients bring with them to their early sessions with you? Most people are coming to be because they have been unsuccessful on their own. Misconceptions and myths are jumbled into their knowledge and it takes time to shake them loose. Most are related to dieting and nutrition. Many people tend to be very strong but less flexible and vice versa. Can you comment more on this combination of strength and flexibility? Ideally we push for the perfect blend of strength and mobility. A balance is a constant struggle. It is important to be Brawny and Gumby. And funny enough strength gains are best obtained through a healthy practice of mobility. When clients are working their butts off in a training session, I imagine that many emotions can arise. What’s your experience been with the mind, body and spirit connection in fitness training? It is huge. Challenging someone physically brings up many other issues in their life. I’ve found that exercise has a mellowing effect on major issues. A high heart rate and exhausted body cope, accept and develop the mind and spirit exponentially. The health & wellness book that I recommend the most to clients is Michael Pollan’s Food Rules. Are you able to work with clients who are recovering from injury? Is there crossover in the work that you can do with clients and what physical therapists do in the injury recovery process? There is an ever-expanding grey area between my work and physical therapist. In fact, many of my fellow students in school are PTs today. From experience and collaboration I’ve successfully treated many people recovering from all sorts of injuries. EXPERIENCE is everything in a trainer’s value. Many people would agree that while the rewards of spending time in the gym are great, the atmosphere could get old. How do you keep the training experience fresh for clients? Do you take the workout outside the gym? I constantly do outside workshops and fieldtrips with my clients. My clients become a part of the Pearman Fitness Family. I teach them to rock climb, hike, how to run, and how to enjoy the outdoors. After all, we are training to improve our ability to adapt and enjoy any physical situation. Do you have a favorite story of client transformation that you can share? I can’t share names but I’ve had many successful client transformations from 50+ lbs of weight loss to training for a summit of Mount Kilimanjaro. But my favorite stories always revolve around mental and spiritual transformations. Seeing a client glow with happiness and find peace, that’s my favorite. The piece of advice that I find myself giving most often to my clients is to be consistent and adapt a complete lifestyle renovation. Contact and learn more about Johnny Pearman on his Facebook page. Or meet Johnny, learn tips and join in on the fitness adventure on his You Tube page.